Next time you find yourself wrestling with a website that should have died decades ago, consider putting Selenium to work and getting on the automation bus. Read on for an example and tutorial. I take the bus everyday. It's terrific. There's nothing better than getting a full sixty minutes everyday to close your eyes, drink coffee, and get lost in a podcast before work. 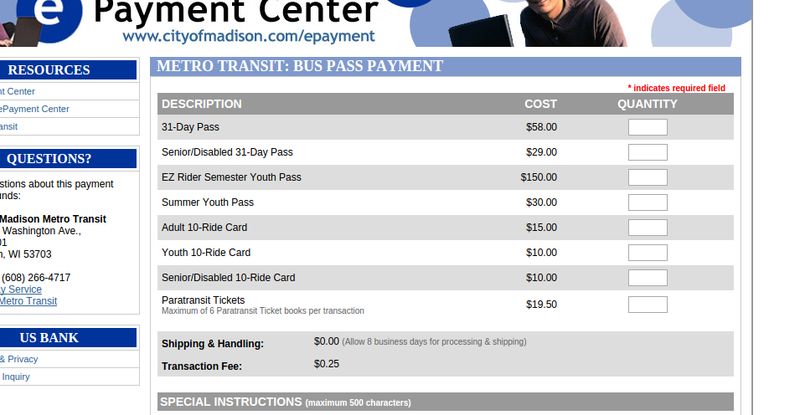 I wish I could say that purchasing bus passes from Madison's website was just as relaxing. Because my wife picks me up from work in the afternoon, it is most cost effective for me to buy a new Adult 10 Ride voucher every two weeks. Every two weeks, I have to dig through their crusty website to find their purchase form. All in all, there are about six pages across two different domains—each loaded with their own set of over-crowded menus and repetitive forms. I am sure I was using the site wrong. At one point I tried to make a persistent account. I bailed half way through, fearing I was actually about to sign up for a miracle pill or a magazine subscription. There had to be another way! Sure, perhaps the old 2015 Alex would have just endured this bi-weekly punishment. But this is 2016, damnit. Even typing those numbers in this blog post makes me feel like I am living in a science fiction novel. This year, I decided not to put up with this chore. I decided to adapt, survive, and make a Selenium script that would traverse this awful website for me. Selenium is a terrific little service that allows you to programatically navigate web pages. It is a great choice for integration testing and end-to-end testing when you need more granular control over your browser. Selenium is available in most languages. I went with the python wrapper . As a warning, this is essentially a web-scraper. Scripts that programatically navigate websites work best with plainly-named ID tags and simple, native HTML widgets. The fewer bells and whistles, the better. This makes a municipal website like www.cityofmadison.com a great candidate for Selenium automation. Let's walk through busbot . Here is the basic skeleton of the script. Running this script (after installing the selenium pip package) will open Firefox to the Google homepage. Instead of the Google homepage, let's go to the first page of the ordering process, this url . Here we see our first obstacle—the dreaded "Terms and Conditions". To their credit, this is much better than the iTunes one. This is easy enough with Selenium. We can select the element by ID, click it, then do the same with the "confirm" button. Works like a charm. The program passes the confirmation and follows a redirection to the next page. Now, we need to enter the quantity of tickets. We can grab the "Adult 10-Ride" quantity input by its unique ID and send text input. Further down on the page, we find our first contact information form. These fields are missing ID's. Do we slink away in defeat? Of course not. Selenium's API has ample methods for retrieving elements from the DOM. As it happens, each input has a unique name attribute. We simply need to retrieve each input by its name attribute and send it text, just as we did before. But, the iterative nature of this form gives us a chance to be fancy. I chose to put each value in a name/value dict and iterate over each pair. What about "State"? This isn't a text field on the page, so sending input via the keyboard will not get it to select "WI". We need to treat the dropdown differently. We can select the element, then search for child elements by tag name, which we expect to be option elements. Selenium will return a list, allowing us to iteratively inspect and click a qualifying option. We can now add "State" to the dict and add a small special case to handle this. 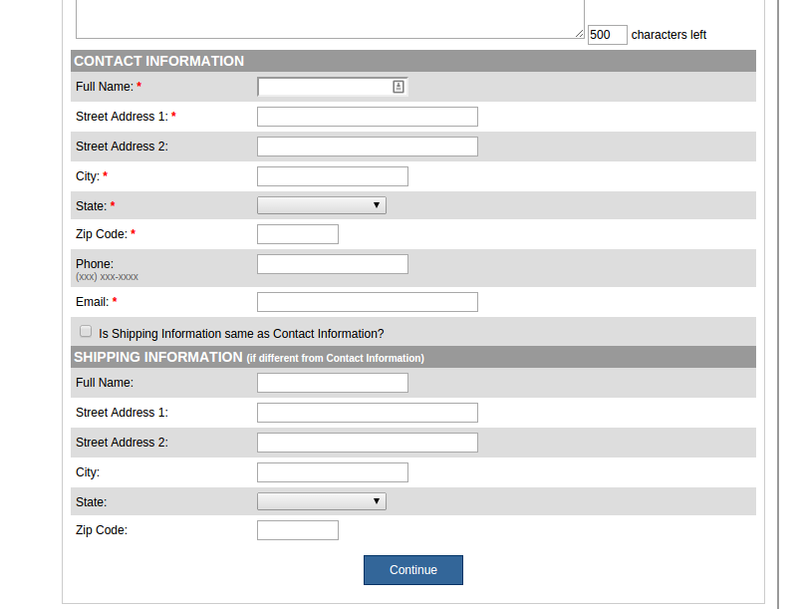 Next, we tick the "Shipping information same as Contact Information" option and submit the form. The rest of the code is rinse and repeat. I've cleaned up the project and modified it to read personal data out of a YAML file before execution—just in case any fellow public transit warriors want to use it themselves. Here is a demo of the whole run through using fake data. The last page throws a payment validation error. Call me a miser, but I didn't feel like giving away my real credit card number just for the sake of a demo. Looking at Selenium's python API , it's not hard to imagine how to take this further. Next time you find yourself wrestling with a website that should have died decades ago, consider putting Selenium to work and getting on the automation bus. Published at DZone with permission of alexrecker , DZone MVB. See the original article here.